When Valve announced their Steam controller they claimed that it would be capable of controlling any game on the PC. A bold claim considering the PC’s is the domain of game’s requiring the precision of a mouse and variety of input of a keyboard. Valve have put out a video showing how the controller copes with Civilization V; Papers, Please; Counter-Strike: Global Offensive; and Portal 2. Hint: it works really well. With Sony and Microsoft pretty successfully developing controllers that manage shooters, Portal 2 and Counter-Strike control how you’d expect. Though the narrator does draw attention to the precision the trackpads allow. It’s Civilization V that stands out. 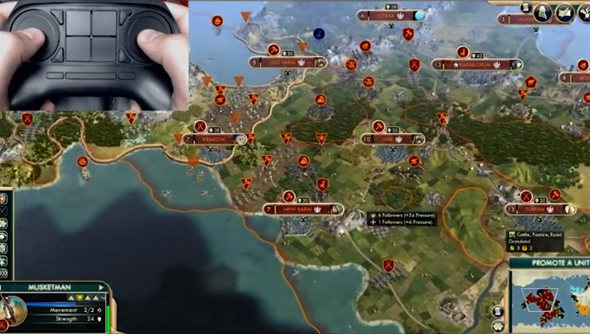 There was no intention for controller support when Firaxis made Civilization V but the controller manages the game fine. The left trackpad is bound to the camera controls and the right to the mouse. It looks less speedy than playing the game with the mouse but by no means a difficult approach.